Food allergies and comfort zones go hand in hand. I’ll be the first to say that it’s easier to stay home the majority of the time for meals, and be in a safe zone. Then reality hits, and you just need a vacation. There’s only one thing to do……go for it! My son is allergic to dairy, egg, peanut, carrot, pumpkin, celery, strawberry, raw tomato and we avoid tree nuts. 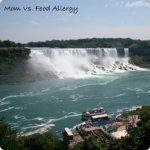 We’ve been managing his food allergies for 4 years now, and I’ve learned some simple tricks to making traveling with food allergies away from home much easier. It’s my goal to enjoy life to the fullest, regardless of his food allergies. We’ve learned how to stay safe while keeping our vacations full of fun and relaxation! 1. Pick a well-populated, domestic destination. A few of our favorites are Grand Haven, MI (all the beach without the heat), Sleeping Bear Dunes (outdoor lovers paradise), and Indianapolis, IN (outstanding children’s museum). Don’t try flying to Rome or backpacking in the deep woods until you’re really comfortable in managing food allergies-just keep it simple. 2. Decide on a hotel or house/condo rental. My favorite is renting a house if at all possible. Sharing it with family or friends brings down the cost, and being able to cook meals is a huge help. I even cook and freeze meals ahead so that I don’t have to cook much while on vacation. One of my most used websites in finding a place to rent is www.vrbo.com. 3. Locate hospitals/urgent care centers. Simple Google searches can help you locate the nearest hospitals to your destination. Program the hospital address into your smartphone or GPS, but in a true allergic emergency, always call 911. Through local hospitals you might find food allergy support groups in your destination city. Contacting these support groups could open up a wealth of information on where to eat, relax, and play. If you’re willing to make the extra effort in contacting them, you just might make some new food allergy friends while making your trip safer. 4. Call the local Chamber of Commerce. Last summer, while in the Sleeping Bear Dunes area, we actually visited a local Chamber of Commerce to ask about local health food stores. I had forgotten my son’s beloved Daiya Foods shredded cheese at home and was desperate to find a store that carried it. I ended up not finding the dairy-free cheese, but I did find Applegate lunchmeat, which is also very allergy-friendly. I also called the CofC to ask about grocery stores in the town where we were staying. 5. Make an itinerary and menu. Having an idea of where and what you’ll be eating and doing will take an enormous amount of stress off you as the parent. Having a menu planned and a shopping list pre-written will making shopping and cooking a breeze once you get settled in your home away from home. Don’t forget to pre-wash dishes before cooking and use foil on the grill if provided with a house rental! 6. Pack food. And then more food. I always pack an enormous amount of safe food and snacks. Don’t forget to cook meals ahead and freeze them to take along, as well as safe snacks/treats to share with other people who may be traveling with you. 7. Have an emergency plan. Make sure you have a plan in the unfortunate event that an allergic reaction may occur. While on vacation, if you have to use epinephrine auto-injector, call 911. Before vacationing, decide which parent would ride in the ambulance with your child, and which parent would take care of the other children in the family. 8. Carry your Epi-Pen or Auvi-Q! Always carry your medications, especially epinephrine. It might even be wise to have your allergist write prescription for extra epi-pens. Be prepared to keep them at the appropriate temperatures in the heat or cold, depending on your destinations weather. In this post, I talk about some products that make traveling much easier for our family. 10. Relax. I know, this is the hard part. Vacations can be harder at times that just staying home, but the extra work to make it safe is worth it for our children. Happy Vacationing! I could add more tips, but what tips would YOU add?